Pagham dropped two points to lowly Eastbourne United on Tuesday night in a dreary game of few chances and no goals. There were few attempts on goal for either team and when United changed to what to all intents and purposes was a back six, there was never likely to be. The first move of note came in the 11th minute when a ball over the top by Jack Rowe-Hurst was grabbed by United keeper Matt Dann at the feet of Callum Overton. Three minutes later at the other end, Lions keeper James Binfield had to be at his very best to stop forward Richard Pingling who had burst through the middle. In the 19th minute, Overton had Pagham’s best chance of the game when he fired wide from the edge of the six-yard box. It was all Pagham now but a period of sustained pressure in the Eastbourne box brought nothing but a couple of half chances that they couldn’t convert. Eastbourne made a half chance themselves on the break before Ryan Cox blasted just wide from 30 yards. Binfield made the save of the game after 32 minutes when he pushed a curling United free-kick round the post, but there was little more action at either end until the last minute of the half, when keeper Dann pushed an Overton header wide. The second half started brightly for the Lions and Rowe-Hurst was desperately unlucky to see his far post header hit the bar and fly off to safety. The game then sank into kick and rush football with Pagham having the majority of play but unable to make any more real chances. Young Alfie Davidson, Ryan’s brother, made his first-team debut after 69 minutes replacing Shane Brazil and was inches away from winning the game for the Lions when, stretching as hard as he might, he just could not get his foot to a left-wing cross with the goal gaping. Pagham’s only other chance came in the 70th minute when a cheekily taken quick corner almost found Overton at the far post but a combination of two defenders and the post thwarted his attempt. And that was it, a disappointing end to a game that will not live long in the memory! Pagham: Binfield, Williamson, Cox, R Davidson, Wollers, Horncastle, Chick, Van Driel, Brazil (A Davidson), Overton, Rowe-Hurst. Subs not used: Hendrick, Ashmore, Prisk. 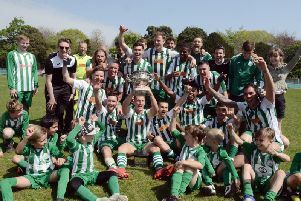 * Chichester City eased into the next round of the Peter Bentley Cup by hammering Mile Oak 6-0. A double from Rob Hutchings, along with singles from Scott Jones, youngster Ethan Enders, Sam Ndlovu and Josh Clack saw City thump Mile Oak in a fine display. City started well, with Clack delivering the ball to the back post, and Ndlovu headed to Rory Biggs who set up Matt Axell, with Chi’s captain seeing his shot go narrowly wide. Keeper Jordan Matthews was called into action, pulling out a smart stop to deny Adam Dine. Jones had a golden chance to be first on the scoresheet, but saw his left-footed effort go wide when one on one with the visiting keeper Bako Xhemal. The impressive Biggs was denied by Xhemal's last-ditch stop, with Ndlovu having a shot blocked as Chi pushed for an opener. A moment of magic by Clack and Jones saw the deadlock broken. The winger pulled out the tricks to beat his marker, playing the ball across the six-yard box where the deadly striker flicked it in. Ndlovu, bright throughout, went on a mazy run and was denied by another smart stop from the busy Xhemal. For Oak, Jack Stenning found Craig Anderson, but the visitors were denied an equaliser by the impressive Matthews. That save proved crucial as in the 25th minute, Hutchings bagged his first, curling an effort into the corner of Xhemal’s goal, after intense pressure from the home side. Hutchings and Clack showed great understanding, linking up, with Clack being denied a goal after a double save from Xhemal. Terrell Lewis, who has impressed this season, found Clack, who in turn found Jones, with the usually clinical striker overhitting his first touch and Xhemal scrambled out to collect the loose ball. Clack had another chance before half time, but the stubborn Xhemal stood firm again. Hutchings didn’t have to wait long after the restart for his second. After a give and go with Ndlovu, the powerful playmaker provided a fine finish. Biggs continued to shine, setting up Ndlovu, who magically turned, but his shot blazed just wide, much to the frustration of Chi’s number 11. The returning George Way then provided an assist, with fellow substitute and youngster Enders heading home, for City’s fourth of the game. Lewis, a fans' favourite, next went on a determined burst and was denied by yet another top drawer save from Xhemal. Without him, the score could have been akin to rugby. There were two much deserved late goals, firstly from Ndlovu after quick feet from the winger, and a late tap-in for Clack, from a great delivery from Lewis. City are back at Oaklands Park this Saturday - they face Lancing at 3pm. * In the SCFL division one Sidlesham went down 5-2 at Oakwood - Frazer Smith and Ben Mepham their scorers.